OmegAvail™ TG1000 is a highly potent, non-GMO fish oil, containing an impressive 1, 000 mg omega-3 oils per softgel, making it an ideal choice for therapeutic dosing. Each softgel contains 662mg EPA and 250mg DHA, along with other omega-3 fatty acids. 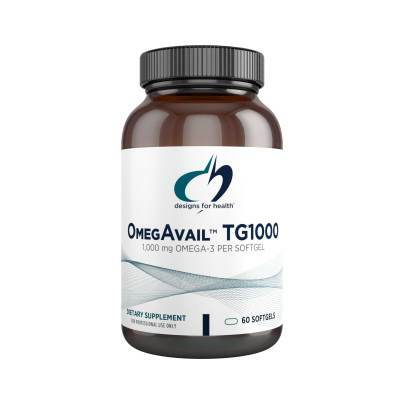 As with all Designs for Health fish oil products, OmegAvail™ TG1000 contains the triglyceride (TG) form for superior absorption and bioavailability. Other Ingredients: Natural lemon flavor, mixed tocopherols, lipase; bovine gelatin, water, glycerine, annatto (natural color)(softgel ingredients).